It’s worse than a hang-over. I miss the Olympics! Amazing athletes, cool opening and closing ceremonies; Rio in 2016 can’t come quickly enough for me. So what’s the remedy for this malady? Watching a movie might help. Chariots of Fire is perfect for those of you who can’t get enough of track and field events. 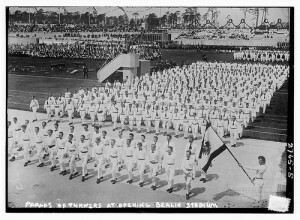 For a broader, historical view, take a look at Olympia, Leni Riefenstahl’s documentary of the 1936 Berlin Olympics, or The Real Olympics, which combines reenactments of the ancient games with highlights from recent ones. Want to know more about the last London Olympics in 1948? Check out the photos on the National Media Museum’s Flickr set. Unlike the 2012 Games, this one was run on a such a tight budget that it became known as the Austerity Games. More beautiful images, along with an engaging (and brief! always good for the summer) history of the ancient games can be found in this book documenting the Olympic architecture designed by Santiago Calatrava for the 2004 Athens games. And sometimes relief can be found by simply turning on your television. Medalists from 2012 are racking up those endorsements which helps keep them alive in our consciousness. So how many people in the U.S. have/do/are [blank]?